For me, renting a car always seems to be fraught with extra charges and salespeople who are trying to up-sell me insurance. I hope I won't jinx myself by relating my positive car rental experience through Costco. I decided to rent through the Costco travel site because I write this blog. I was pretty sure I knew how to get the best deal from discount travel websites, and I didn't believe that Costco could beat those, but I decided to experiment. First, I signed into my Costco account on-line and went to travel; on the left side, one of the options is "rent a car". I entered destination and dates. Aside from the great rate, renting through Costco involved an automatic upgrade. Usually, I rent the absolutely smallest, cheapest car, a car so small, that fitting Bob's and my luggage into the trunk would have been a problem. 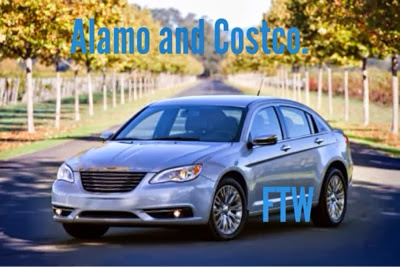 Alamo gave me a Chrysler 200, and while it wasn't luxurious, it was comfortable and had only 6,000 miles on the odometer. I enjoyed driving into my reunion at the Grove City Country Club in a car that wasn't teeny tiny. The rate, $12.06 a day, couldn't be beat. Not knowing the Pittsburg airport area, I opted to buy the automatic prepaid refill on 1/2 tank of gas. It was just luck that I happened to use almost exactly 1/2 tank, so this worked for me - no madly looking for gas stations at the last minute, or paying the outrageous fill-up price if I didn't return the car with the gas tank full. I would have been bothered by wasting money on that. I haven't rented from Alamo before, so I don't know if the ease was Alamo or the Pittsburgh airport. In and out couldn't have been simpler, Alamo gave me the key in the airport, I walked to the car, drove off, returned the car three days later, handed them the key, and was on my way. No waiting in line, no schlepping to a distant off-site location. The easy car rental is a compliment to the Pittsburg airport, but not entirely. Folks renting from other car companies didn't seem to be having the same easy time I was. I will definitely rent from Alamo and go through Costco for car rentals again. It seemed an easy process, but deserves to be tested elsewhere, that is - in a different airport or two. A Chrysler 200 (this was my first time in one) is at best on the lower end of mid-sized cars. It was just fine for us for a minimal amount of driving in a short period of time. I would NOT want to be in a smaller vehicle. I always use Costco for a car rental. It's easy, cheap, and you get a free second driver. If the price drops, you just rebook at the lower rate.